Twenty years ago, three young men on Chicago's South Side sat down together and wrote a song about the transcendent power of music. On the other side of the Atlantic, a young guy in a provincial Belgian town heard the fruits of their labour and smiled. 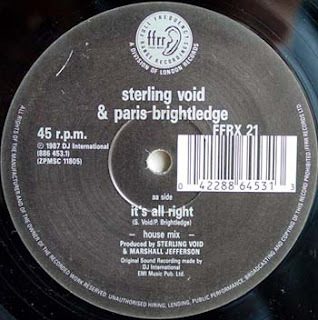 You'll have to ask DJ Sensu yourself what that record – It's All Right by Sterling Void & Paris Brightledge (co-written with Marshall Jefferson) – means to him. Inspired both by Marvin Gaye's What's Going On and the vision and passion of British rock icons such as John Lennon, Mick Jagger, Roger Waters and Robert Plant, Void, Brightledge and Jefferson produced the first socially conscious piece of Chicago House music, but with a message that still resonates today: there's a whole heap of trouble in the world, but, just for one night, for the length of one song even, music can bring people together. And it will continue to do so, in spite of wars, despots and dictators: "Generations will come and go but there's one thing for sure, music is our life's foundation and will succeed all the nations to come." What can a guy with two turntables and a mixer do or say about the crisis in Iraq (or the crisis in Belgium)? Nothing much. Yet when Americans and Iraqis, Kurds and Turks, or Flemings and Walloons hear a DJ drop a killer tune and respond with the same enthusiasm, maybe that says everything and is enough. Is it minimal, is it dubstep, is it techno, is it disco? It's all pop music and it's all right. "The music plays forever…"
Justin Toland is a contributor to Fact magazine and promotes the monthly Brussels club night, Music Muziek Musique, where he deejays as The Phantom.